Background: This 73,000-acre expanse of near-pristine land is cut by a perennial creek flanked by riparian vegetation, oak woodlands, and rugged, chaparral-covered hills. This is tule elk and bald eagle country. The creek's North Fork draws American wigions and other waterfowl in the fall; streamside vegetation shelters great blue herons, belted kingfishers, even river otters. Golden and bald eagles often perch nearby, watching for brown trout. The oak woodlands and chaparral draw many spring songbirds and the hills are ablaze with wildflowers, including the rare adobe lily. Wild turkeys inhabit the woodlands, usually within a mile of water. When creek flows are sufficient, view the area by raft. Watch for black bears along the creek. The name of the water body comes from Hudson's Bay Company trappers who cached their furs along the Sacramento River and smaller tributaries, one of which became known to them as Cache Creek. One of their camps, recognized by early settlers as French Camp, was situated in a grove of oaks on the north bank of Cache Creek one mile east of the present town of Yolo, California. Cache Creek was originally known to the Hudson's Bay Company trappers as Rivi?re la Cache. The Habitat: Along the creek, wetland grasses, rushes and sedges grow under a canopy of cottonwoods, willows, oaks and alders providing excellent wildlife habitat. About half the Cache Creek area is shrubland, with vegetation including mixed chaparral, serpentine chaparral and chamise chaparral. The remainder of the area is about equally divided between native oaks and grassland. The Experience: Wilderness Area, Cache Creek Wild and Scenic River designation, 2 Areas of Critical Environmental Concern. 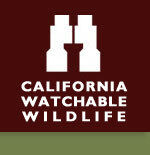 Wildlife and Where to Find It: Foot, horseback, and by raft when creek flows are sufficient. Viewing Tips: Tule elk and blacktail deer can be seen from October through April; look on hillsides, near cover. Bald eagles can be seen year-round, but are more common from November through March. Look for river otters near entrance, south of Highway 20, under bridge - an undeveloped site. Please respect private property boundaries. Viewing on foot, horseback; have patience. Watch for elk one mile west of entrance, near gravel pit on Highway 20. Elk also seen near junction of Highways 16 and 20. Site Notes: This secluded, hilly expanse of oak woodlands, grasslands, and chaparral is a combination of over 70,000 acres of BLM managed lands and 4,700 acres of State and County lands. The Natural Area is traversed by Cache Creek, with its year-round water flow. Elevation ranges from 3,200 feet atop Brushy Sky High, down to 600 feet in the eastern end of Cache Creek along State Route 16. Showcasing the area is about 35 miles of the main fork of Cache Creek and 2.5 miles of the north fork. Also present are several tributary creeks that contain permanent water. Parking Notes: The Cache Creek Natural Area is a primitive area, closed to motorized vehicles. Non-hunting (target) shooting is not allowed. Instead, the area is managed to improve habitat for wildlife and rare plants, to protect cultural resource values, and to offer primitive recreation opportunities, including wildlife viewing, river running, hiking, equestrian use, hunting and fishing. How to Get There: Interstate 5 to Williams, California. West on Highway 20 18 miles to Highway 16. South on Highway 16 one mile to Cowboy Camp wildlife viewing area or from Clearlake Oaks on Highway 20, drive east 8 miles to site entrance.